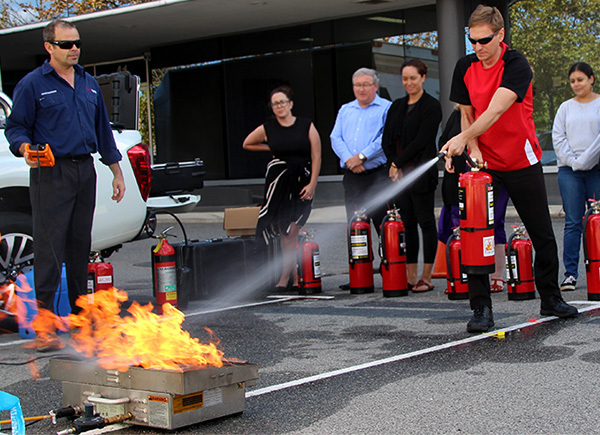 CMG Fire and Safety Services can offer your organisation non accredited and nationally accredited real-life Fire Extinguisher Training using the latest advancements in fire training technology. Our Fire Extinguisher Training is targeted to all staff with a strong focus on safely suppressing a fire with an extinguisher, fire blankets and optional hose reel. The live-fire training system detects a trainee’s technique, and then will automatically vary its flames in response, providing a realistic training experience. The system uses readily available air and water instead of costly dry chemical or CO2, meaning multiple employees can safely train in a single day in a clean and cost-effective manner. To ensure the safety of your staff, the emergency-stop switch on the handheld controller and a motion sensor will shut down the flames instantly if the system is bumped or knocked making the BullEx live-fire training system the safest live-fire simulators available. In addition to this specialist safety feature, there is a wide range of fire types and difficulty levels offered, catering to your organisation’s specific needs. Practical hands-on training for each trainee using the ‘BullsEx’ intelligent training system (I.T.S). This training can also be combined with the Fire Warden Training if required. We also offer a nationally accredited Fire Extinguisher Training course entitled: CPPFES2005A – Demonstrate First Attack Fire Fighting Equipment. This training can also be combined with PUAWER005B – Operate as part of an emergency control organisation (Warden Training) if required, please contact us for details. If you wish to know more about Fire Extinguisher Training, please fill in the following form and one of our team will reply within the next 24 hours.